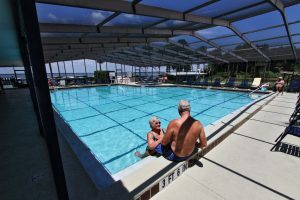 What comes to mind when you think about an active adult community for people 55 and older in Central Florida? Do you want to have plenty to do only footsteps from your door? Or lots of shopping, dining, and sightseeing opportunities within easy driving distance? Fortunately, there’s an active adult community in Leesburg that can help you enjoy all those things – as well as resort-style living in a waterfront setting – while also helping you make the most of your retirement savings. It’s Lake Griffin Harbor, a community composed of about 350 high-quality manufactured homes nestled on the southern edge of one of the most exquisite lakes in Central FL. And it’s a community owned and operated by Blair Group, an award-winning developer of manufactured home communities for older adults. When you visit our well-maintained, active adult community and see amenities such as a marina, boat ramp, and luxury clubhouse with screened pool and hot tub, you might wonder whether you can afford to live here. In fact, this lifestyle is within most retirement budgets because of our formula that combines first-class amenities open to all residents with quality manufactured homes for sale that cost less than most traditional site-built homes. At Lake Griffin Harbor, we take pride in offering an Affordable Florida Lifestyle. Not only that, but only a short drive will take you to some of the Sunshine State’s best-known tourist destinations, including world-famous beaches and theme parks. Once you visit, you’ll realize that Lake Griffin Harbor in Central Florida practically defines the term active adult community. So why wait? Contact one of our Lifestyle Consultants today for more information and to schedule a tour.